Fly like Iron Man and dive like a dolphin! Bookings are essential, please call 07 5591 0085 or 0404445000. Minimum age for Flyboarding is 12 years. Enjoy a 5-minute Flyboard session! It is surprisingly easy to fly like Iron Man and dive like a dolphin with this amazing new experience! It is your time to shine! After your ride, you are welcome to relax at the resort swimming pools and café. 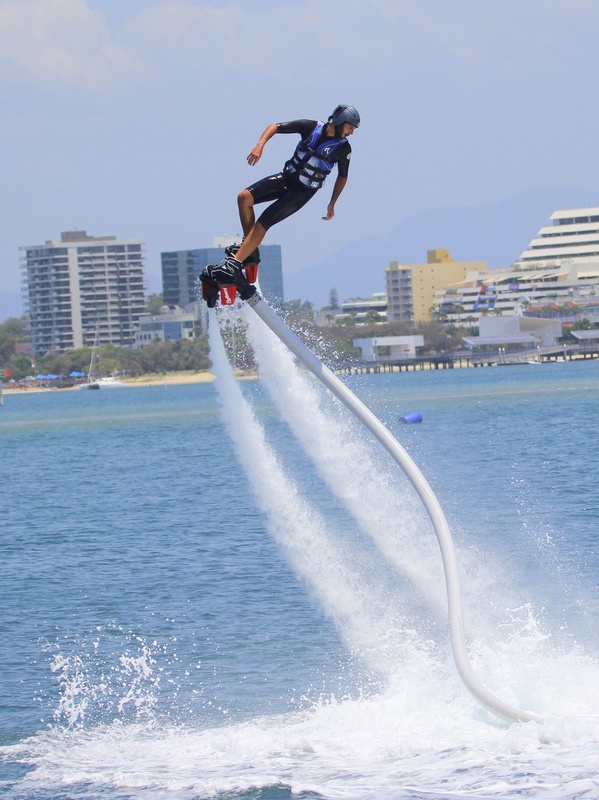 The Fly Board is a singular experience that cannot be duplicated on any other craft and best of all, the friendly, experienced staff at Gold Coast Watersports are confident they can get most people doing basic tricks in under ten minutes. Your experienced instructor will help you to attempt these adrenaline-pumping moves! Make sure you bring sunscreen and swimmers!